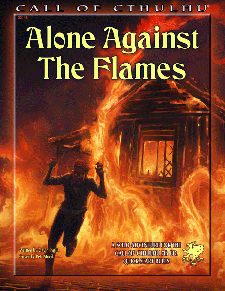 Alone Against the Flames was created to help players adopt the latest rule-set for Call of Cthulhu published by Chaosium. This is a solo adventure for the Call of Cthulhu game. It is a horror story set in the 1920s where you are the main character, and your choices determine the outcome. It is also designed to lead you through the basic rules of the game is a gradual and entertaining fashion. Although most such adventures are played with your friends, this one is just for you. Before you begin to play, make sure you have a copy of the Call of Cthulhu Seventh Edition Rules, and a blank investigator sheet. You can download a printable investigator sheet, or an interactive PDF version of the sheet, as well as the Quick-Start Rules from www.chaosium.com. You'll also need a pencil, an eraser, and some roleplaying dice. You don't need to read the rules before you start playing. Just settle in a comfortable chair before a roaring fire. Then read on and follow the instructions. ...On second thoughts, don't sit too close to the fire. A solo adventure for the Call of Cthulhu 7th Edition Quick-Start rules.